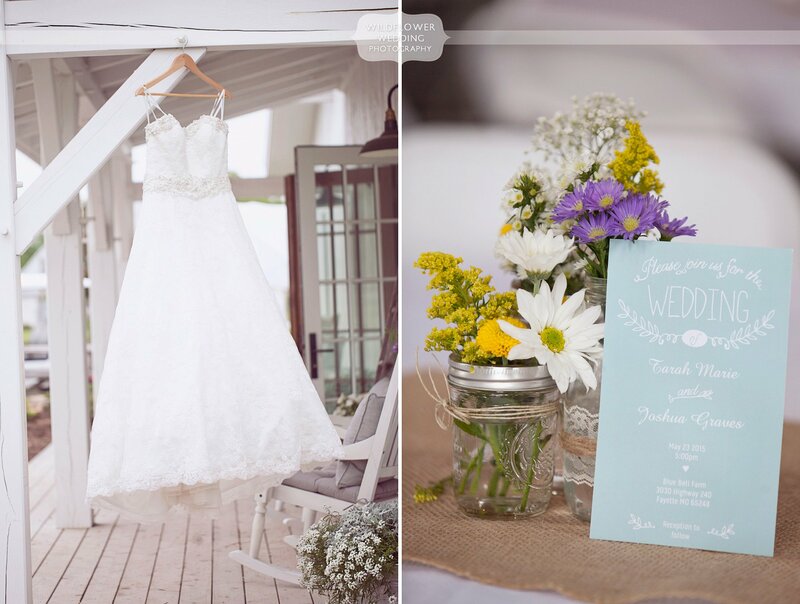 There is just something magical about having an outdoor barn wedding. Listening to the birds chirp above you and feeling the wind rustle the leaves as you say, “I do” is amazing. We specialize in outdoor wedding photography because we love all of these things. The gorgeous natural light is also an added bonus! But we also feel most comfortable in the great outdoors. We feel a connection to the natural world and lucked out with clients who share that connection. Scroll down to see all of our favorite photos from this outdoor barn wedding at the historic Blue Bell Farm venue in mid-Missouri. Tarah and Josh chose a Tiffany & Co. blue color theme for the wedding. From the Converse shoes to the bridesmaids dresses, that signature robin’s egg blue color was woven seamlessly throughout the day. Rustic wooden signs dotted the property, giving guests direction about where important events were happening. 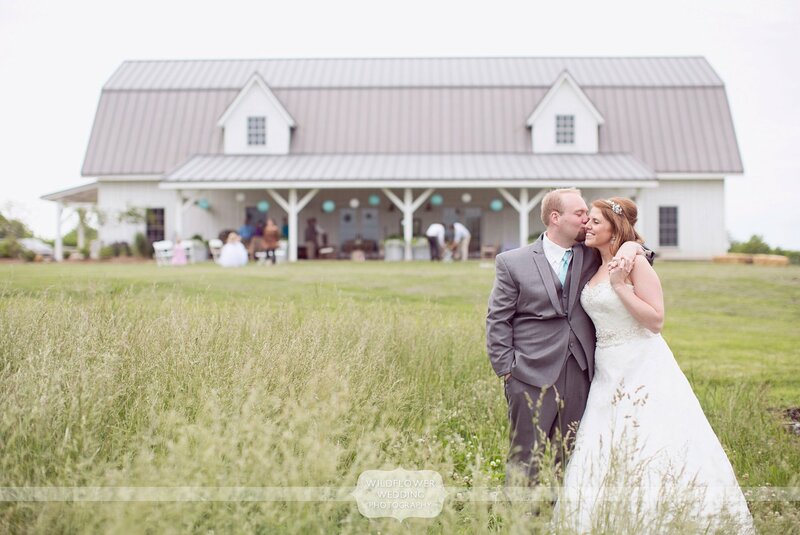 After their outdoor ceremony in the lower field at Blue Bell, guests were ushered into the white barn for the reception. Decorated with lace and burlap, the barn was filled with wildflower centerpieces. We loved the edible wedding favors of smores packages for guests. At the end of the night, guests gathered around the fire. Everyone seemed to enjoy sharing in that tasty camp tradition of melted chocolate, roasted gooey marshmallows and graham crackers! Tarah and Josh were two of the most calm, cool and collected couples we have ever photographed. More than once I thought they should write a book about how to plan a stress-free wedding day! Thanks to Tarah and Josh for sharing their wonderful wedding day with us. 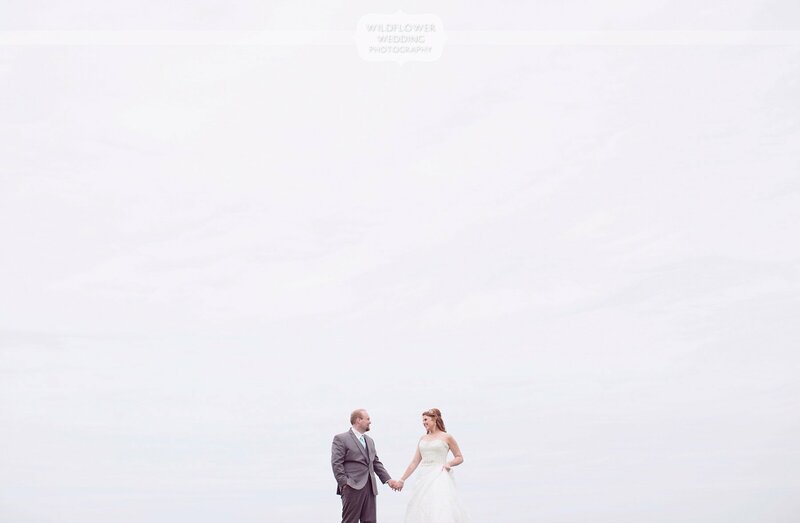 These two are clearly soulmates and we loved every minute of documenting their day.